Photo from Dr. Stefka Hristova, MTU Associate Professor of Digital Media Nathan Shaiyen poses in front of his work in the “Framed by Frames” Photography exhibit at the Copper Country Community Arts Center's Kerredge Gallery. Shaiyen explores the theme of “conversations” through portraits. From portraits to time traveling to the great outdoors, Michigan Technological University students show it all in the “Framed by Frames” photography exhibit hosted by the Copper Country Community Arts Center in its Kerredge Gallery, which is available to view until April 28. The exhibit offers an exploration into the people, places, and objects that students encounter on their journeys on campus and beyond. It was organized by Associate Professor of Digital Media, Dr. Stefka Hristova. She said she wanted to showcase the talent of the students to the community. “I love the ways in which the photographs convey their personality,” said Hristova. She said Shaiyen’s work shows how he is social; Zhu’s work shows how he is an observer who likes to be behind the scenes; Kolb’s work shows his love and appreciation of the outdoors; and Lowney’s work shows his challenge of others to let themselves wander. A graduating senior, Zhu said he began working in photography at a very young age and enjoys the “process of creation.” He loves that you don’t need a lot to create photographs, just a camera and a subject. “It’s very easy to duplicate and do yourself,” he exclaimed. Zhu’s work in the exhibit showcases seasons, with the help of his friend and a prop. He said his work has a time capsule aspect about it. Zhu spends a lot of time capturing photos of the campus and hopes to take more galaxy and outdoors-related photos. Lowney and Kolb, another graduating senior, both had photos that focused on the outdoors. “When you get away from all of the infrastructure you get to enjoy the world as it once was, which most people don’t get to enjoy nowadays,” said Kolb. Kolb, who got into photography through family, wanted to showcase the beauty of the landscape. He spent days and late nights hiking to capture some of the photos, with many being taken between 1 and 3 a.m. He focused on a lot of remote places and said he learned a lot about composition, framing and patience. The Luxemburg, Wisconsin, native said he joined the photography class to advance his skills and get a deeper understanding. He’s very appreciative of Hristova for allowing him to be apart of the exhibit and hopes to head west and delve deeper into his capturing of the wilderness. 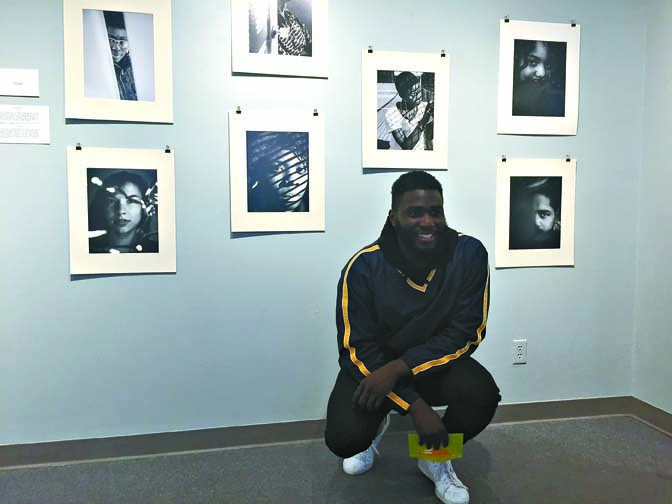 The exhibition is supported in part by a grant from the Michigan Council for Arts and Cultural Affairs with funding from the National Endowment for the Arts and Michigan Tech University. It can be seen at the Copper Country Community Arts Center, located at 126 Quincy Street in Hancock.